Posted under Parents' Articles. Updated 18 April 2019. BMI is a ratio of a person’s height and weight. Growth charts track BMI over time and are associated with classifications of underweight, normal, overweight, or obese which may not be an indicator of health. A high BMI in combination with poor eating habits and lack of exercise can mean that a person is at risk for health-related problems such as high blood pressure or diabetes. A low BMI in combination with decreased food intake or skipping meals can mean that a person is at risk for health-related problems such as a compromised immune system and malnutrition. BMI is a ratio of a person’s height and weight, and does not directly measure a person’s health status, muscle, bone, body fat, or body water. A high BMI in combination with poor eating habits and lack of exercise can mean that a person is at risk for health-related problems such as high blood pressure and diabetes. A low BMI in combination with decreased food intake or skipping meals and snacks can mean that a person is at risk for health-related problems such as a compromised immune system and malnutrition. 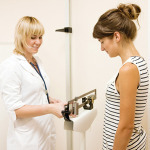 To figure out a teen’s BMI, an accurate weight and height is needed. BMI is then measured using the mathematical formula shown here. Your child’s weight (in pounds) times 703 divided by her height (in inches) squared. You can use online calculators to figure out BMI here: Children and Teens (age 2-19) and Adults (age 20+). The best way to interpret a teen’s BMI is to track it over time on her growth chart. Teens should stay at about the same BMI percentile during their teen years. If a teen’s BMI percentile goes up or down quickly, she should talk with her health care provider to talk about the possible reasons for the change. Example: A 14 year 3 month old female has a BMI of 27.6. 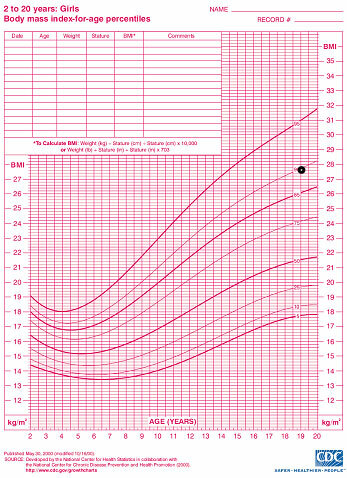 Using the girls’ 2-20 year old BMI growth chart, her BMI plots right above the 95th percentile, which classifies her as obese. No matter what your child’s BMI percentile is, it’s important to ask if it has changed over the last couple of years. Although BMI can change when growing or going through puberty, teens should ideally stay at about the same BMI percentile during their teen years. BMI is used to identify teens who may be at higher risk for certain health problems. A teen whose BMI falls into the classification of underweight, overweight, or obese should be seen by her health care provider and a registered dietitian to assess risk for any health-related complications and to make sure your child is getting all the nutrients he or she needs to grow healthy and strong. What are BMI report cards? Some schools in the United States are checking weights and heights of students at school, calculating BMI, and sending this information home to parents as a BMI report card. The controversial report cards are used to identify teens who are underweight, overweight, or obese. If your daughter brings home a BMI report card, have her bring it with her when she sees her health care provider and/or registered dietitian so they can explain the information on the card. BMI is just an estimate of body size, and is not a good indicator of overall health. This is especially true for muscular teens (such as those who exercise or are very athletic). Their weight may be higher because of extra “muscle mass” and not because of extra body fat, and BMI doesn’t take into account how much muscle someone has. Additionally, BMI should be cautiously interpreted in teens that are growing or going through puberty. During these times, weight, height, and body fat change at different times and rates, which can affect BMI. Whether or not your teen eats healthy foods and is physically active is more important to their health than what their BMI classification is.